The estimates are based on partial consensus Y-mutation rate of 0.82×10^-9 mutations/nucleotide/year for a defined Y-sequence area (comBED, 857 regions, 8.4 mbp) using SNP counting (See Adamov et al. 2015, 0.82 also in Poznik et al. 2013, 0.8 in Fu et al. 2014, 0.78 in Balanovsky et al 2015, 0.87 in Helgason et al. 2015). The calibration by Adamov et al. 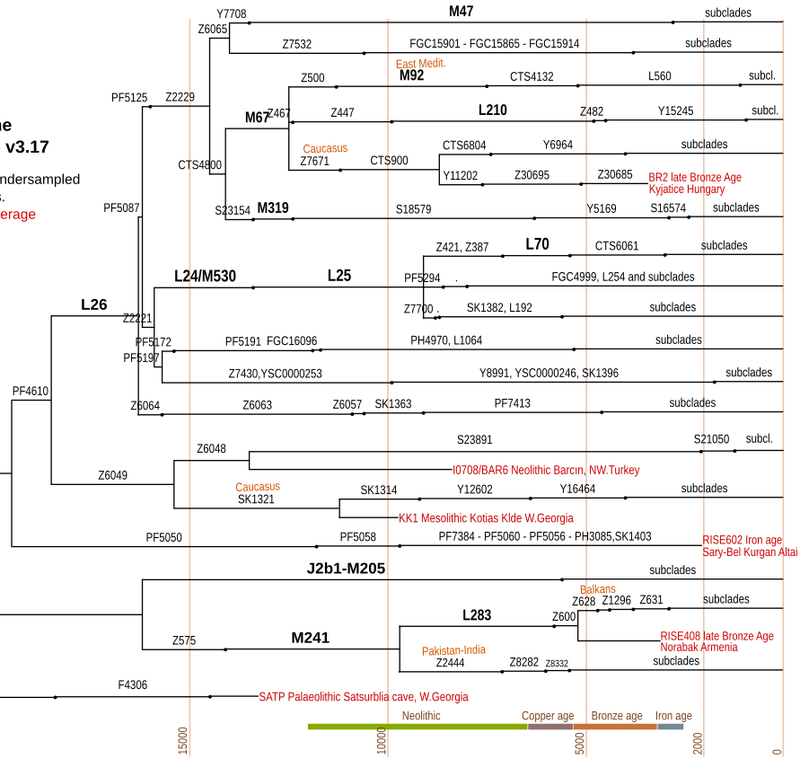 was based mainly on Anzick-1 (Q1a2a1b-Z780, 12632 years BP) with verification trough 41 samples representing 14 genealogies (0.80), Ust-Ishim (0.78, K-M2335, 45000 years BP), Kostenki-K14 (max. 1.08, C1-K29, 37000 years BP). The rate seems consistent for haplogroups ca. 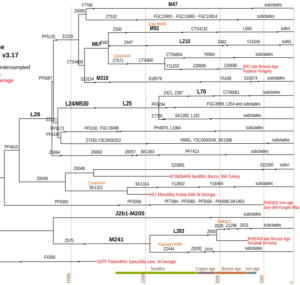 13,000 years old, for genealogical time-frame slightly higher mutation rates might be informative (0.87 Helgason et al. 2015, 753 males, 274 patrilines, 15.2 Mb Y-sequence, 1,365 meioses, 47,123 years). 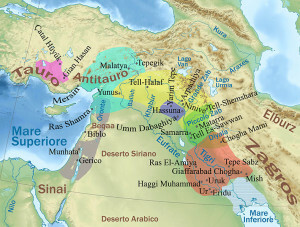 The J2 haplogroup evolved in or near Western Asia, likely in the area delimited by: Eastern Black Sea, Southern Caspian Sea, Zagros Mountains slopes and Glacial Arabo-Persian Gulf Oasis. It separated from the J1 clade ca. 32,000 ybp and diversified in J2a and J2b ca. 28,000 ybp. Further estimates including 95% CI see YFull YTree J2. For a calibration point set at CDEF-M168 (see phylotree.org/Y) with 70 ka (kiloannus = thousend years) ago according to Karafet et al. 2009 the matching Y-Mutation rate is ca. 0.8×10^-9 mutations/nucleotide/year. If you like to follow/join discussion on J2 haplogroup ages, look at this MolGen Forum thread: age of main J-M304 nodes (J1, J2, J2a, J2b) haplogroup. Ancient Y-DNA discussion: no J2a in pre-antiquity Europe?